Keeper of the Wild, Berjaya Elahan works for Hutan, World Land Trust’s overseas project partner in Malaysia. Here he describes the Orang-utan bridge project, which enables Orang-utans to move freely across rivers in the Kinabatangan. The Kinabatangan floodplain, one of Malaysia’s most beautiful wetlands, is home to a large Orang-utan population. But unlike the Proboscis Monkey and many other primates living in this dense network of waterways, Orang-utans are not fond of water and they do not swim. Instead, to cross rivers they rely on natural bridges formed by canopies of tall trees that meet over the water. In the 1950s, intensive logging began in the region and majestic riverine trees that formed natural bridges were the first to be felled and then floated down the river to the town of Sandakan. Since then, Orang-utans have been unable to cross rivers. 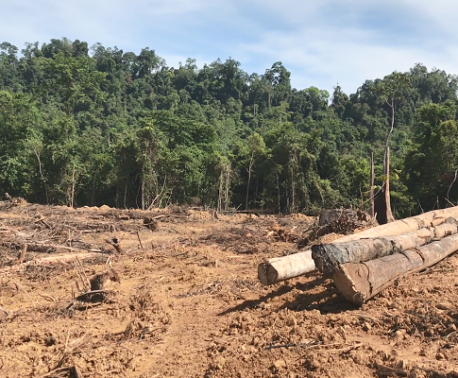 Although logging operations have now stopped in the Kinabatangan, the remaining forest and its canopy is still damaged and it may take centuries before the trees reach their original size. In 2005, much of the remaining forests of the Kinabatangan were finally protected as a wildlife sanctuary. At the same time, studies by Hutan and Cardiff University showed that some 1,000 Orang-utans in the Kinabatangan were fragmented into 20 sub-populations. These small groups of Orang-utans were facing the risk of extinction because of inbreeding and loss of genetic diversity. Factors causing the isolation included plantations (since the 1980s, large areas of the Kinabatangan wetlands have been converted to oil palm plantations), roads, drainage channels, villages and … rivers. In 2005, Hutan started the Orang-utan bridge project. Orang-utans travel high in the tree canopy, swinging by the arms from branch to branch, so a footbridge was out of the question. Instead, we built hanging bridges over rivers, anchored on the largest possible trees on both sides of the rivers. We tested different materials (simple rope or metal chains inserted into plastic hoses, and even fire hoses) and designs (single, double and triple line bridges). We were also advised and assisted by zoos (such as Chester Zoo) with a long experience of using Orang-utan bridges in their exhibits. As of today, we have built 10 bridges. But, were the Orang-utans actually using the bridges? We spent hours hiding in the bushes, watching the bridges in the hope of seeing an Orang-utan venturing above the water. We saw hundreds of macaques and squirrels using the bridges, but no Orang-utans. Then we started to hear reports from local fishermen that Orang-utans were using the bridges. We finally obtained our first picture in 2010. Since then, there have been many sightings of Orang-utans using the bridges and we are confident of having achieved our aim. Orang-utans have a very special form of intelligence. Researchers in the wild and zookeepers often say that when an Orang-utan is presented with a new object or a new task, it will “study” it calmly for a long time. And when it finally acts, the Orang-utan is likely to get things right the first time. Maybe this is what happened with the bridges. In the hot humid tropics, things get damaged and break down fast. For us Wildlife Wardens, the last thing we want is an accident to happen. If a bridge breaks and an Orang-utan falls into the water, it will most probably drown. We constantly check the condition of the bridges, their anchor points on the trees, and carry out minor repairs. 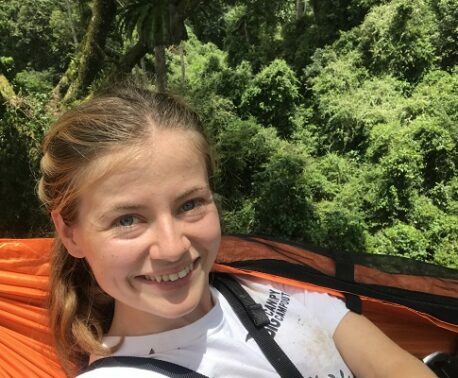 This involves a lot of climbing and although most of us climbed coconut trees as children, we are reluctant to hang out in tree branches over crocodile infested rivers. 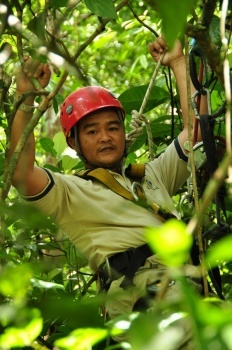 Today we are trained by an experienced climber in the techniques of tree climbing with harnesses and safety equipment. Apart from our Orang-utan bridge project, we are also engaged several other initiatives to create and secure vital forest corridors for wildlife along the Kinabatangan River. We are replanting tens of thousands of native trees in areas where the forest have been destroyed by logging. And more recently we have started a pioneering project with World Land Trust – the Borneo Rainforest Appeal – to purchase privately-owned land along the Kinabatangan and secure a forest corridor for Orang-utans and other wildlife connecting two fragments of protected areas. I very much hope that all these efforts will help solve the human-wildlife conflicts that we see today in the Kinabatangan, and that one day soon Orang-utans, elephants and all other wildlife species will be able to live and travel safely again though our forests. During WLT’s Big Match Fortnight (2-16 October 2013) all donations to the Borneo Rainforest Appeal will be matched, making them go twice as far. You can donate online, over the phone or by sending a cheque.